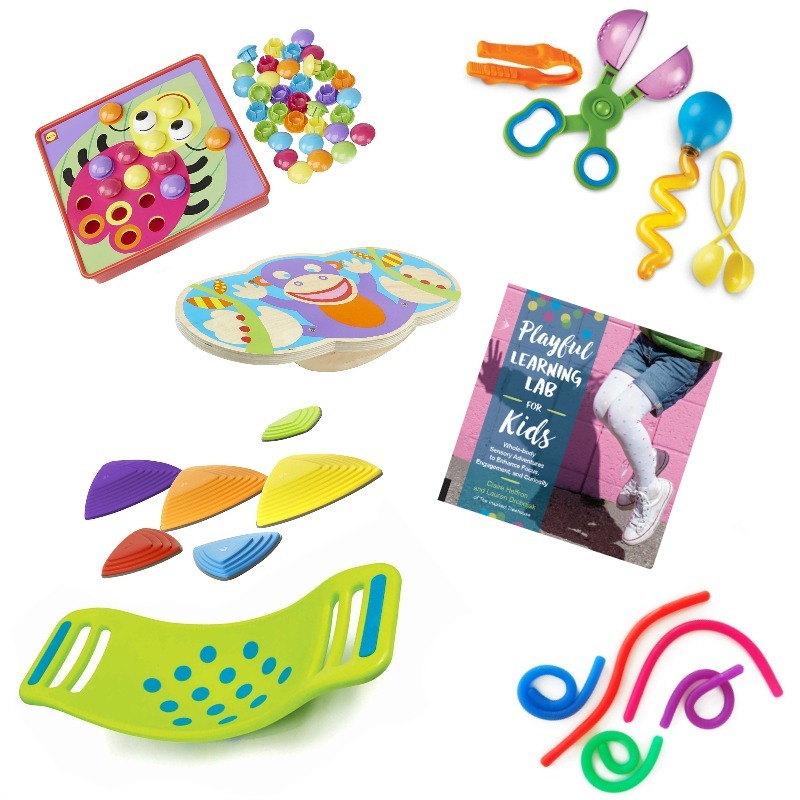 These kids gift ideas are perfect for promoting developmental skills for all ages and abilities! Have you started your holiday shopping yet? I logged into my Google account yesterday and was immediately confronted with my daughters’ wish lists, color-coded with fancy fonts as if they will get exactly what they want as long as it all looks good on paper! :) So I decided to jump in on their game and create the 2018 Holiday Gift Guide for The Inspired Treehouse. I had so much fun compiling our favorite fine motor, gross motor and sensory motor toys and activities this year! Since starting our non-profit organization, The Treehouse Ohio, in the fall of 2017, we have received generous donations of toys and products from companies like TumblTrak (their Hands and Feet are a favorite! ), FlagHouse (check out their great balance beams), and Boomwhackers! Being able to see kids the toys in action with our kiddos makes it even easier to make recommendations! 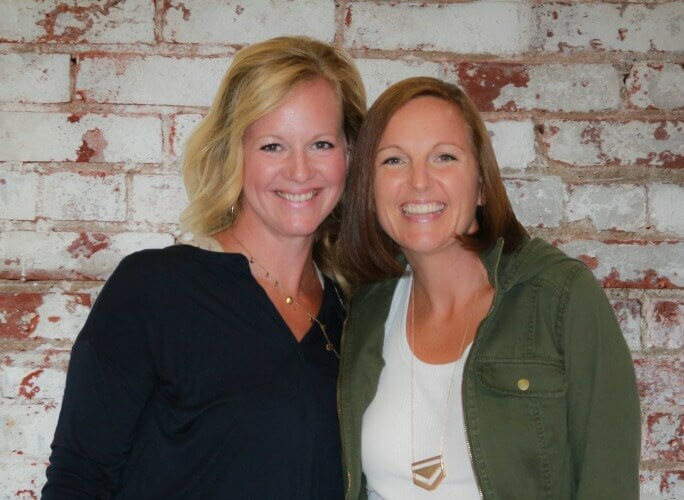 You will see some great new finds along with a few old favorites that will never go out of style and that we always have at the ready in our therapy bags. So here are our favorite kids gift ideas, broken down by sensory, fine motor and gross motor ideas to make your kid’s holiday the best one yet! 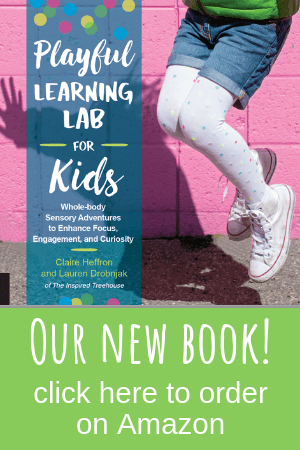 1 || Playful Learning Lab for Kids – Reinvent the way kids learn by infusing active, whole-body, multi-sensory activities into your home or classroom. The activities in Playful Learning Lab for Kids explore concepts in reading, language, math, art, music, science, geography, and social studies, all while engaging children with movements, touch, sound, and sight. Most distinguishing of all, the activities and lessons here include suggestions for tailoring the experience to different levels, making it a book children can grow with. 2 || Messy Play Kits – These sweet kits combine science, art and sensory play and include everything you need for amazingly fun, messy (and totally washable) activities! Monthly subscriptions, stocking stuffers, and sensory bins also available. 3 || Monkey Noodle – Stretch, pull, twirl, wrap and squeeze them – then watch them bounce back to their original shape! They’re perfect for sensory play. 4 || Fidget Bands – Help calm fidgety students and improve their focus with these adjustable bands that help them get the movement they need while seated at their desk. 5 || The Sleep Sleeve – Combat many of the problems that kids complain of with weighted blankets–too hot, not adjustable, no breathability — with this deep touch pressure option. The stretchable twin-sized sheets offer firm, calming support for a relaxing night’s sleep. 1 || Button Art – This 10 picture, 46 colorful button set is designed for preschoolers to develop hand-eye coordination, fine motor skills and creative thinking. 2 || Spike the Fine Motor Hedgehog – Your kiddo will build fine motor skills with chunky, peg-shaped pieces that fit to the back of this super cute hedgehog. 3 || Skoolzy Pegboard Set – Babies, toddlers and preschoolers will all love stacking these oversized, colorful pegs to create patterns while strengthening fine motor skills, hand eye coordination, visual discrimination and more! 4 || Jumbo Nuts and Bolts – Help to promote in hand manipulation and fine motor development through hands on play with the twisting, turning action of this set. 5 || Helping Hands Tool Set – Four fabulous little tools come in this set including tweezers, scoopers and droppers to build hand strength. Try them in a sensory bin full of water or beans and rice for hours of fun! 6 || Coloring Matching Eggs Set – 12 charming eggs in a carton will help preschoolers learn to count, sort, and match! Each plastic egg contains a different color and number, with corresponding pegs and holes. 7 || Squigz – An all time favorite at The Inspired Treehouse, you will never imagine how many fun ways there are to play with these “fun little suckers”! 1 || Alex Monkey Balance Board – Perfectly sized for little feet–yet able to accommodate larger ones–this sturdy, wooden wobbly board helps kids improve their balance and coordination. 2 || Gonge Riverstones – The goal is to make it across the floor without touching the ground and by only stepping on these colorful stones that vary in size to enhance the challenge. 3 || Teeter Popper – Rock it, roll it, sit in it, or stand – endless ways to play; meanwhile – POP POP POP POP POP! – the suction cups pop as the Teeter Popper rocks! 4 || Bubble Chopper – This toy is a hit every time it comes out of our therapy bag! Kids use their bilateral coordination skills to pull the ripcord and send bubbles flying into the air. Then…up the challenge by having them run, hop, skip, or jump to try to catch the chopper and pop the bubbles before starting all over again! 5 || Roll and Play Game – This plush cube comes with 48 game cards that encourage creativity, active play and gross motor skills. 6 || Sturdy Burdy – Your kids will love this fun and silly game of striking poses and balancing. Ideal for ages 5-7. I came across your gift ideas and loved them all! 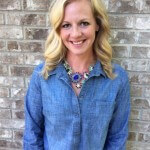 My product is new and so far we are seeing fabulous results. Check out the Neuromat and let me know if this is something you’d like to recommend to your readers. 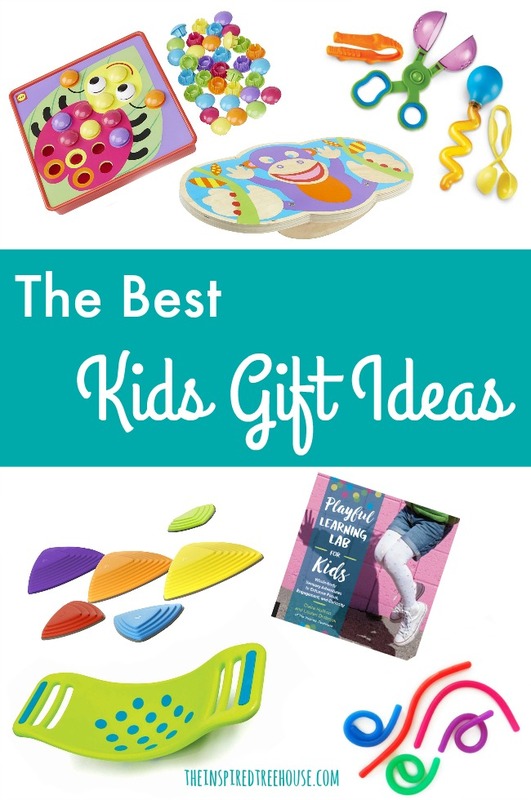 Do you think kids will love these gifts? I really hope so. Check this https://essaydragon.com/blog/exam-tips site so we can discuss it more.